Hewlett Packard floods market with nine new cameras aimed at people who like convenience, and don't care too much for good-quality photos. I don't mean to sound pessimistic, but HP has never been much for high image quality. It took a lot to muster up enough enthusiasm to post this article. But, lo! All is not lost! 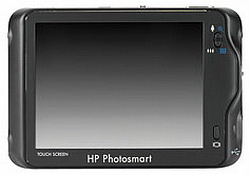 Among the nine lackluster cameras, HP brings forth the R937, which has a unique 3.6" touch screen LCD. Also, it has the built in "slimming feature" which comes in very handy in the USA. Somewhere I've read it shaves 10lbs off ones behind, a good start but more is needed--much more!!! :) Don't forget the "blemish remover" or "touch up" feature. This is a good in-camera tool for removing those unsightly cigarette burns from shirts and trousers before printing your pictures out. There's another bright spot too. 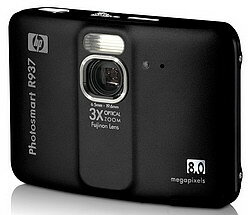 The Photosmart E337 5MP camera is priced at $79.99, which would be a good item to keep stowed on the dashboard of the car. Oddly, HP hasn't released much information on the new cameras, in the mean time, we'll wait with bated breath! * Microsoft windows Vista™ compatible tagging. * Out in August '07. 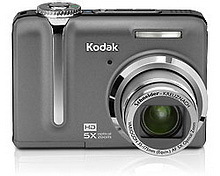 * No lens info but 3x optical zoom, 8x digital. * Black or silver bodies? * Lot's of secrets still for this camera. Notice the very pretty cameras below. 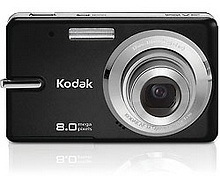 Kodak announced a new line of low-end point and shoot models with an "M" designation. It's funny, but I recall just a couple of weeks ago Kodak was saying they were getting out of the unprofitable "low-end" digital camera market. I'm not sure what low-end means in the world of big-business, but these little jewels start at a mere $149 and top out in the neighborhood of $199. No price on the M883 as of yet. I'd say $149 is low-end. The "M" series appears to be marketed squarely at style conscious young people--with colors available such as Pink Bliss, or Espresso! How 'bout Red hot, or Plum? No optical image stabilization on any of these six, but they're marketing "digital image stabilization" obviously to reduce costs. 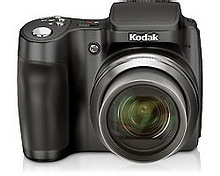 Next, we have two compact big zooms, the Z1275 with a 12mp sensor and a 37mm-175mm lens, plus HD video at 1280x720 30fps! The 7.1mp ZD710 comes with the now 4 year old 38mm-380mm zoom lens. 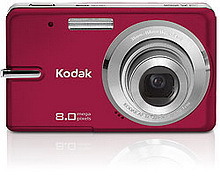 I'm not much of a Kodak fan, I think the best thing they've come out with in a long time is the P880, the 24mm-140mm fixed lens camera, which is still available. 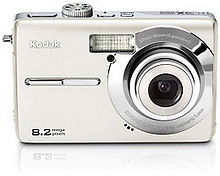 It appears Kodak is still resisting the wide angle (28mm) trend for some reason. 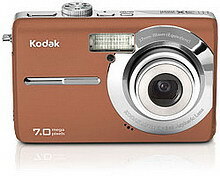 All information and photos come from the Kodak consumer products website. M883 3" LCD 3x zoom, all else secret! Sharp-eyed visitors will notice the new "Idle chat room" link to the left, which is a one-way affair. This is where I'll post stuff that has little or no value to the camera/photography connoisseur. I've already finished two entries, one, in which I foam at the mouth about Sony and their two high-end lenses, and the latest is a light hearted look at my Sony Ericsson camera phone vs a cheesy Kodak I found in the garbage can. Go to the link on the left or...Check out my latest hard work at the typewritter here! I've been busy the last few weeks, I'll post some photos in the upcoming "Idle chat room" link on the nav bar. First up, I've got some lens reviews in the works. I'm going to compare the Nikon 105mm F/2.8G VR micro lens to my Sigma 105mm F/2.8 macro, which costs half as much, that'll be interesting, yup, I'm doing some renting. Next will be the Sony 50mm F/1.4. Check out the "Coming up" link on the left to see all the lens reviews-six or seven!